Combine berries with 1 cup of sugar and tapioca in a bowl at least half an hour before baking, preferably 2 hours or so. Set aside. Preheat over to 425 degree F.
Dust countertop/big cutting board & rolling pin with flour. (If you have access to a ceramic rolling pin, chill it prior to baking.) Roll out first ball of dough until it’s 1 inch wider than pie plate diameter on all sides. Fold into half and then once again to transfer into plate, then unfold after moving it over. Press closed any cracks. Add filling. Roll out the other ball of dough, this time making an oval (for lattice) or circle for closed pie. Slice into 1/2″ strips. Weave into lattice over the pie filling. 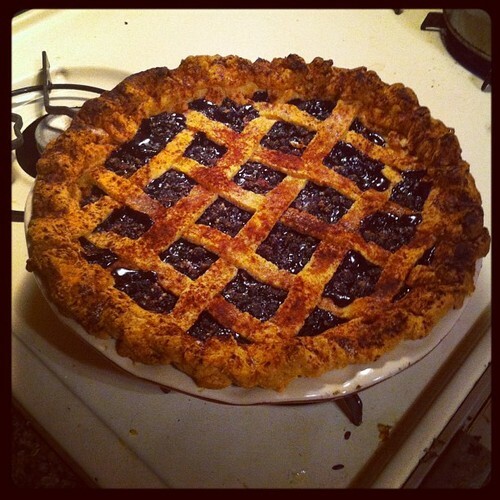 (If pie top is one piece, make sure to cut 8 1″ slit into it to allow steam to escape.) Press the top and bottom crust together with two fingers to form a wave. Brush the top of the piece with milk. Sprinkle with cinnamon sugar. Bake for 15 minutes at 425, then reduce heat to 350 degrees F. Bake for 45 minutes. Check to see if blueberries are bubbling. If not, check back periodically every 10 minutes. If crust is browning too fast, reduce heat further to 325. Let cool for at least a few minutes — filling will be boiling hot and will gel as it cools. Goes well with cold milk, tea or a la mode.